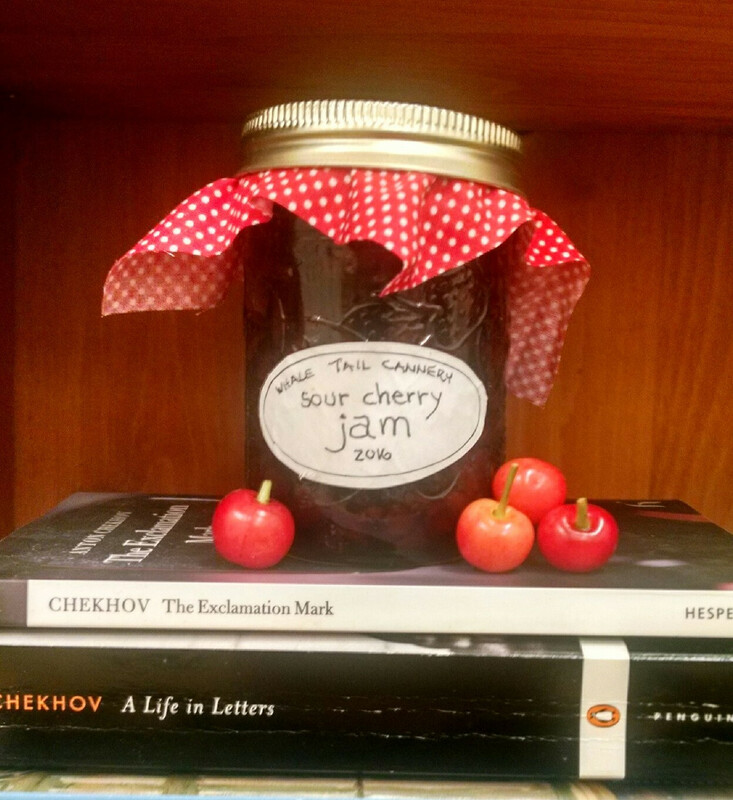 Cherries and Chekhov | Writing and nibbling on cherries . . . . The above quote, shared at my Central Carolina Community College workshop last Saturday, does more than express the intensity of flash fiction; it also illustrates how quickly the time passed! Our Flash Fiction Bootcamp II did indeed end far too quickly! In fact, we were still writing when the security guard at Central Carolina Community College came around and politely tapped her watch. But me and the seven devotees (eight if you count my trusty assistant, husband Johnpaul) of creative writing could have kept writing for hours…. We opened with an inspirational reading of Liz Wride’s terrific flash, Painted, published April 11 on Milk Candy Review. For our first prompt, we riffed on her evocative first line (“They passed a law that everyone had to…..”) as a spark for our own stories. The results were both pithy and magical, ranging from “be kind to each other” or “own a Komodo dragon.” So much fun! Thank you Liz! Other prompts included writing a flash from a favorite pet’s point of view and taking a cue from the Twilight Zone. One of our students shared a link to the opening narration so you can try this prompt on your own. We also played around with the French technique known as “N + 7″ which involves writing a couple of sentences and substituting nouns with every seventh you find in the dictionary after the original. This mode is particularly helpful when you find yourself stuck in a rut on a story. A new world can be just one word away. As a departure from the norm, for my next CCCC workshop, we’ll tackle a cousin of flash fiction. On Saturday, September 21, 2019 at 9 a.m., we’ll explore the exciting world of flash essays. We’ll also talk about ways to expand short memoir-style pieces into longer formats, taking cues from Susan Shapiro’s The Byline Bible. Hope to see you in September, but in the meantime keep writing and delighting! This entry was posted in Uncategorized and tagged central carolina community college, Central Carolina Community College Creative Writing Program, creative writing, flash essay, flash fiction, liz wride, milk candy review, N+7, painted, short story, technique, virginia woolf on April 20, 2019 by Ashley Memory. Flash Fiction Bootcamp II Coming Soon! Whatever you see, these little bits of wintry precipitation (mixed with sleet) are a bit of a surprise this spring. They’re coating the surface of our bamboo like a dusting of confectioner’s sugar. No yard work today after all. Instead, I’m dreaming ahead to Saturday, April 13, when I’ll lead round 2 of our Flash Fiction Bootcamp at Central Carolina Community College in Pittsboro. Our prompts this time will be brand new and guaranteed to fire your imagination. From writing from a dog’s (or cat, to be fair) point of view to using the innovative N + 7 French method of writing a couple of sentences and replacing every noun with the seventh in a dictionary, these story starters may just be the creative nudge you need for that latent story swimming around in your head. And as usual, I’ll also share a collection of my favorite litmags and contests so that those who wish to revise and see their work in print may pursue these avenues on their own. For more information, and how to register, see below. In the meantime, cuddle up with a mug of hot chocolate, a good book, and a notebook of your own…..
Saturday, April 13 from 9.a.m – 3 p.m. – Flash Fiction Bootcamp II Workshop. Think you don’t have time to write? Anybody has time for flash fiction, and by the end of this workshop, you’ll have five finished stories. (This workshop is a continuation of the popular Flash Fiction Bootcamp I) but is open to new as well as returning students and features entirely new prompts and readings. Atten-hut! Central Carolina Community College Creative Writing Program in Pittsboro, N.C. Register here. or by calling (919) 545-8044. This entry was posted in Uncategorized and tagged central carolina community college, Central Carolina Community College Creative Writing Program, creative writing, flash fiction, N + 7, pittsboro, short story, snow, uwharries, very short story on April 2, 2019 by Ashley Memory. What do you do when you find out you’ve got a little bit of Hollywood in the family? You write a poem about it! By the picture you might think I’m suggesting I’m related to the talented and beautiful Vivien Leigh…..well, not quite! Through my beloved late grandmother, Wilma Dare Hash Thomas, I’m a distant cousin of Addie Hash Warp, the woman who doubled for Vivien Leigh in that famous staircase tumble in Gone with the Wind. In honor of Addie (and of course Vivien), I wrote a poem “Self-Portrait of Stunt Double for Vivien Leigh Falling Down the Stairs in Gone with the Wind” that appears in Turnpike Magazine, Issue No. 4. Here I focus on the jitters I imagine must face all stunt people, no matter how experienced they are, when faced with the daunting task of falling down a long staircase AND filling in for a star. Can you imagine? As for me, I’m a chicken who’s only been on a horse once in her life. Turnpike also kindly published my poem “Ode to the Goddess of Missing Tools,” which is a comic tribute to my husband and all the tools that mysteriously slip through the cracks of our house. There’s a little bit of magic at work here, I’m sure. The fun of a “self-portrait” style poem is that you can imagine yourself as anyone, famous or not, and write from their point of view. It’s a terrific form of escapism and creativity. So….if you’ve always been fascinated by someone and would like to walk (or fall!) in their shoes, give this prompt a try today. This entry was posted in Uncategorized and tagged addie hash warp, ashley memory, elizabeth taylor, equestrienne, gone with the wind, hollywood, national velvet, poem, poetry, staircase, stunt woman, turnpike magazine, vivien leigh on March 18, 2019 by Ashley Memory.